Somerville, Mass – Some goodies from Lonely Planet were waiting for me back in the pink house. These three beauties are the fruits of my labor from the first half of the year. 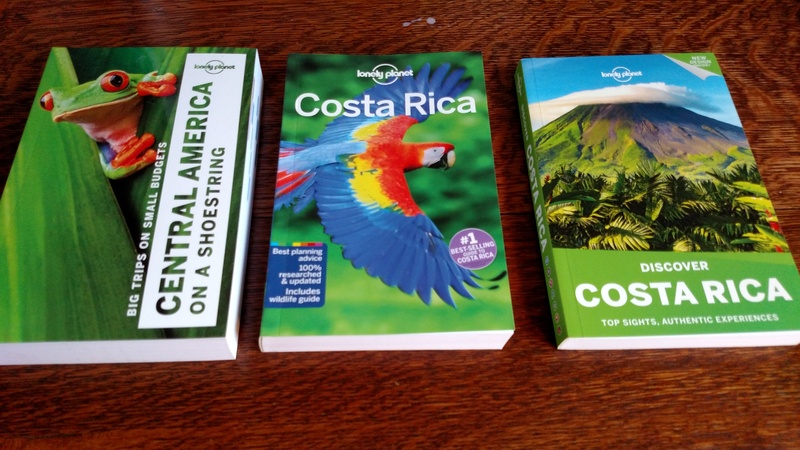 Costa Rica, Discover Costa Rica and Central America on a Shoestring are now available for purchase from a bookstore near you. So, what’s the difference between these books? The Lonely Planet Costa Rica travel guide offers the most comprehensive coverage of Costa Rica, especially targeting independent travelers. As such, the book includes everything that we could fit in there. Discover Costa Rica covers only the “best” destinations, not the whole country. There are more pictures but no hotel reviews. The book is written for folks who are spending a week in Costa Rica, instead of a month. Central America on a Shoestring covers all eight countries (including parts of Mexico). This book targets budget travelers, so it provides bus schedules, money-saving tips and reviews of cheap hostels. Hi Mara. I found your blog on the back of a Lonley Planet Book. We want to travel to CR in Feb. with our 11-year-old. Would you be open to reviewing our itinerary? It’s our first time in CR, so I’m not sure what is doable. Thanks! Hi Jamie, I’m not really in the business of consulting, but I’ll take a quick look. Please send it to mara@havetwinswilltravel.com.